This article provides insight into the four main lines of research through modelling at SKF: bearing steel, fatigue mechanisms, polymer design and tribology. 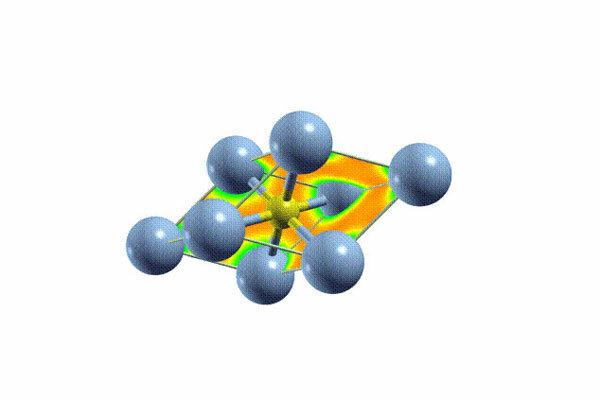 In the past few years SKF has been expanding its knowledge with atomic scale simulation methods such as DFT, MD and DPD, to understand how materials behave in its products. This has enabled and will continue to enable SKF to innovate and cope with ever-increasing technological challenges by ensuring that every atom is in the place it belongs. Imagine if one could become so small that he or she could dive inside solid materials and see the structure of the atoms – how they interact, move and respond when an external force is applied and how the external temperature influences their properties and changes their structure. If this were possible one could better select, process and design the materials used to manufacture products and machines. At the SKF Engineering and Research Centre (ERC) in the Netherlands, research is done with the objective of virtually diving into the materials that make up SKF’s products to achieve a better understanding of their behaviour. This enables SKF to respond to requests from customers and, more importantly, to develop new materials for its products that increase their quality, durability and other specific properties. 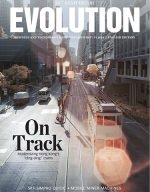 In most of the cases, the use of experimental methods is enough to gain sufficient understanding of how external constraints might affect the materials from which products are made and to find preventive and counteractive solutions. Nevertheless, even with the use of state-of-the-art experimental techniques, it is simply not always possible to get sufficient understanding of the effect that certain phenomena can have on the materials. In addition, in some cases such as with a new material or product that is in the design phase, being limited to the use of laboratory test tools is not always time-efficient or cost-effective. This is why computational methods are essential. 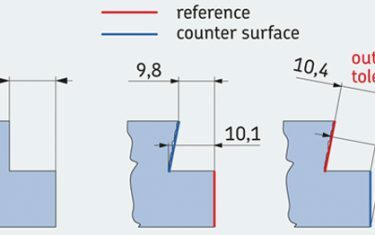 When it comes to mechanical parts, e.g., rolling bearings, most design issues can be worked out using “large scale” simulation techniques, such as the widely used finite element method (FEM). However, some special issues go beyond the capabilities of this modelling tool and require being treated with alternative mesoscopic and microscopic simulation methods. To get a thorough understanding of SKF’s products and be able to tackle the issues that might have an origin at particular time and length scales, scientists at SKF are constantly developing their know-how in the use and advancement of multi-scale simulation methods. This means that there are different tools (imagine magnifying glasses, all with a different magnifying power) that can be used to understand specific phenomena that determine the behaviour of a material in application conditions. This is why the models that are applied at SKF range from quantum mechanical to continuum (fig. 1). 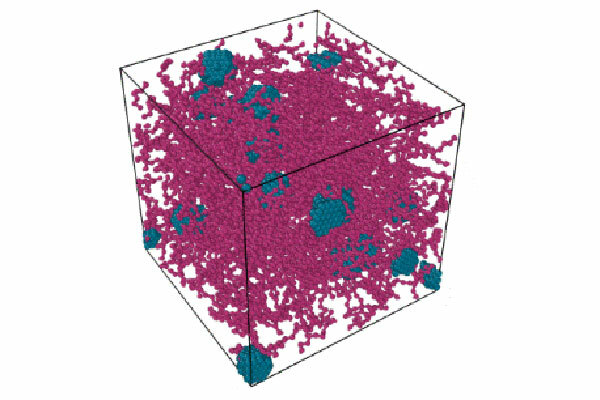 The deeper one dives inside the material, the more calculation power and time are needed to make simulations. For this reason, a high-performance computer cluster with 1,536 processors is being used in SKF facilities. Currently, there are four major lines of research for which meso- and micro-scale methods are used. 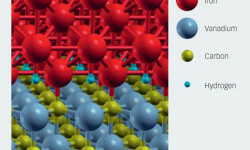 The first line of research is part of the project “MultiHy” , short for Multiscale Modelling of Hydrogen Embrittlement. 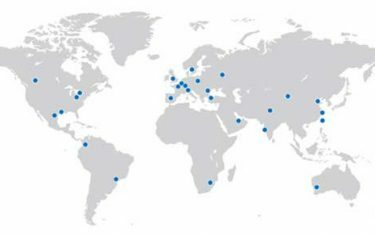 This project is led by a consortium formed by various European industrial and academic partners and is funded by the European Union. The initial motivation for this project is that there is ample experimental evidence  that supports the idea that hydrogen decreases the fatigue life of bearings and structural steels. This effect of hydrogen is known within the technical jargon as hydrogen embrittlement. 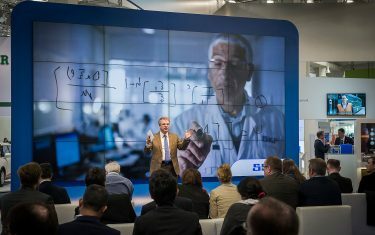 SKF’s main interest in MultiHy is to be able to predict how hydrogen diffuses into and through bearing steels and, more importantly, to discover how available hydrogen can be trapped and immobilized to neutralize the impact of hydrogen embrittlement on bearing service life. 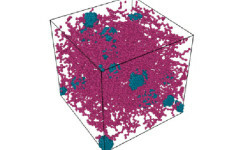 Such simulations on hydrogen mobility and its effects on fatigue life complement other ongoing research dealing with various sources of hydrogen, e.g., humid environments and possible degradation of lubricants. From the atomistic point of view, simulations are being carried out using a computational quantum mechanical modelling method called density functional theory (DFT), which is commonly used to investigate the electronic structure of many-body systems (fig. 2). 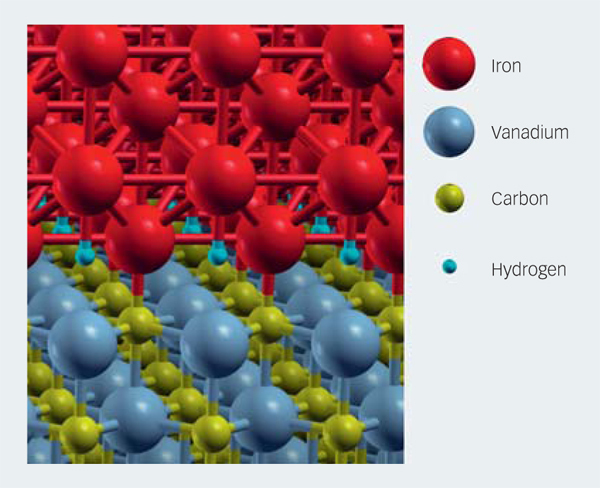 More specifically, simulations are being done to evaluate the mechanical properties and the influence of hydrogen in a new experimental vanadium-containing bearing steel (fig. 3) in which hydrogen can be trapped to avoid embrittlement . 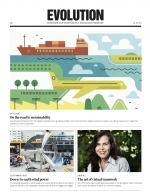 The results of the MultiHy project can help with the final development of this new steel, so that it can eventually be considered for applications where hydrogen resistance is needed. The second line of research is aimed at the atomic description of the microstructure of bearing steels and its influence on the behaviour of the material when subjected to rolling contact fatigue. 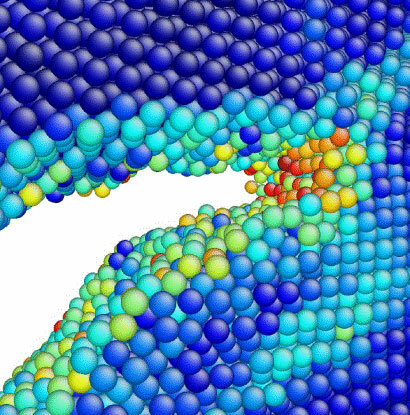 For this project, the molecular dynamics (MD) method is being used to study how the atoms move and interact with each other when a crack is initiating and propagating through bearing steel (fig. 4). The understanding of this phenomenon will enable SKF to find ways to increase the life and overall per-formance of SKF products. The third application deals with the study of filled rubber materials used in the manufacturing of seals. The overall goal is to identify and quantify the physical phenomena taking place at different scales that influence the quasi-static and dynamic stress-strain behaviour of filled rubber. This project is being carried out by SKF in collaboration with scientists from Tsinghua University in China and from the University of Barcelona in Spain. 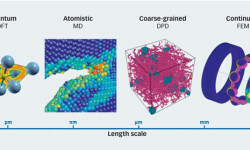 Dissipative particle dynamics (DPD), a meso-scale simulation tool that enables analysis of the dynamic properties of fluids and polymers (fig. 5) at scales that go beyond those that can be treated using MD, is used here. By employing DPD, the effect of various factors, such as the interaction between filler particles and polymer chains and the topological changes in the polymer network in the static and dynamic mechanical behaviour of sealing materials, can be fully considered. The final application addresses the lubricated contact between two surfaces , such as that between a rolling element and a raceway in a hybrid bearing. The method used for this work is also MD. The goal is to explain the fundamental differences in friction and wear between steel/steel and steel/ceramic surfaces to improve the performance of hybrid bearings. Also, chemical reactions between the lubricant and the surfaces can be considered. So far, the modelling has revealed that there are fundamental differences between steel/steel and hybrid contacts related to friction and wear. More importantly, the results have shown that hybrid contacts present lower friction than steel/steel contacts. 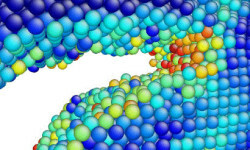 D. Savio, Nanoscale phenomena in lubrication: from atomistic simulations to their integration into continuous models, PhD thesis, Institut National des Sciences Appliquées de Lyon, Karlsruher Institut für Technologie (2013).